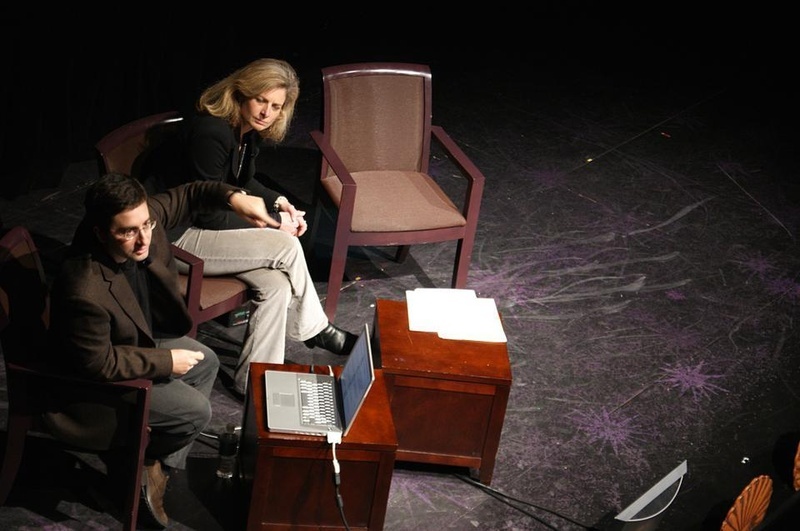 Composer Hèctor Parra and physics professor Lisa Randall discuss the challenges of integrating art and science at the New College Theatre on Feb. 24. In 2005, physics professor Lisa Randall published “Warped Passages”—a book for the layman about the universe’s hidden dimensions—in the hopes that she might inspire the general public to contemplate the possibility of unseen worlds. What she did not expect was to inspire was a new chamber opera. But “Hypermusic Prologue: A Projective Opera in Seven Planes” is exactly that—an original hour-long work of contemporary opera featuring music by Spanish composer Hèctor Parra and a libretto by Randall herself. Both creators of “Hypermusic Prologue” graced the stage of the New College Theater on February 24 to participate in one of two discussions titled “Two Talks: The Art-Science Nexus.” The event, which was sponsored by the Office for the Art’s Learning From Performers Program, shed light on the creative process behind “Hypermusic Prologue” and the challenges of translating such abstract subject-matter to the stage. “I consider this an experiment... it’s trying to project the ideas involved both musically and scientifically,” Randall said. “Hypermusic Prologue,” which premiered last June, tells the story of a baritone with a strict Newtonian view of the physical universe and his soprano partner who is determined to explore new, unseen dimensions. As she proceeds to cross over into the fifth dimension, the opera seeks to convey this journey by exploring new musical and dramatic territories. Much of the discussion focused on how Parra and Randall translated these new scientific theories to the stage through musical innovations. For Randall, however, this project meant more than simply seeing her theories become art; she also wanted to capture the spirit of exploration in the opera, a concept she considers to be fundamental to the scientific pursuit of knowledge. Within the opera itself, Randall parallels the nature of a scientist’s calling with the soprano character’s journey through uncharted dimensions, an endeavor which has been a topic of her scholarly research for years. While some of these finer points about the physics behind “Hypermusic Prologue” may have been lost on the crowd, the opera itself was certainly appreciated by the audience. The event incorporated videos of the original production, as well as musical recordings featuring the vocal talents of soprano Charlotte Ellett and baritone James Bobby. These multimedia elements enlivened the discussion with concrete examples of Parra and Randall’s collaborative efforts. As demonstrated by these recordings, Parra found innovative ways of approaching physics as a musical subject. As the son of a physics professor, he was anxious to integrate his varied interests through this project. Throughout the panel, Parra described how he thought about “warping” music—manipulating elements like tempo and pitch to alter the “mass” of any given note or dilate the listener’s sense of temporality. The resulting sound he produced is quite unique—unsettling, arrhythmic, and as inscrutable as the hidden dimensions that inspired it. Beyond his musical compositions, Parra worked tirelessly to make the opera’s lyrics feel novel. After the soprano crosses into the fifth dimension, her text was translated into what Parra described as “a free language, a multi-dimensional language.” This new tongue—which Parra himself developed specifically for this project—classifies sounds according to unusual parameters. His specific musical notation instructed the vocalists whether to sing with a breathy or pressed voice, falsetto or fry voice, and how to position their jaws. These guidelines produce unfamiliar timbres of the human voice, which Parra then paired with unintelligible bits of sound, mostly strangled syllables and throaty gurgles that were at once alienating and captivating. “Hypermusic Prologue” has already been very successful, but it looks as if the opera will have future life as well. Besides a workshop performance at the Longy School of Music on February 27, the production will make its way in March to the Guggenheim Museum in New York. Just as “Warped Passages” appealed to the lover of literature, so too will “Hypermusic Prologue” appeal to the music-lovers of the world and bring elements of science into an artistic scene typically void of such empirical discourse.